This review will examine the features that the manufacturer has added to provide durability and control. We also look at general specifications before moving on to potential assembly needs and general maintenance tips for the engine as well as other moving parts. Gas-powered driving with child safety is the design criteria of the Go Bowen Go Kart. After the review you can check out a short video where you can see the go-cart in action. This go-cart powered by a 79.5 cc four-stroke overhead-valve engine that is capable of generating 2.5-HP. The gas-powered engine design does not require the mixing of oil and gas like some smaller engine do, keeping operating and maintenance easy for children 13-years old or older. It has a chain driven transmission and an automatic gear system that also provide a simple driving experience for young riders who may be new to operating equipment with engines or motors. A reliable pull start system that uses a strong rip-style cord can be used by older children with little resistance. The Go Bowen Go Kart can reach maximum speeds of 20-mph, but keep in mind that rider weight will play a significant role in determining its top speed. A tubular frame made out of steel provides durability and rigidity to the go-cart, something to consider with high-usage and potential abrasions and bumps. It also makes use of a sturdy roll cage that shields a large portion of the seating area and will offer protection with impacts or rolls. This protection also extends from behind the seating area to offer riders protect for their upper body and head in the event of a rollover. A mesh-style covering increases protection on the sides and front while keeping limbs inside of the go-cart. 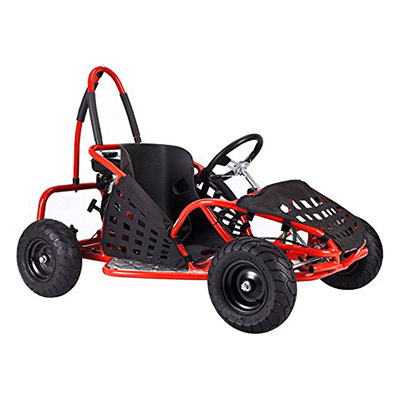 The front and rear tires on the Go Bowen Go Kart are pneumatic and use a street tire tread that offers adequate traction during use. These tires are listed as (4. 10-6) 13-inch and are mounted to steel rims designed to offer extra material strength. This profile produces a ground clearance of 5.9-inches, while the wheelbase on this go-cart measures 36.6-inches. Hydraulic disc brakes on the rear provide the stopping power and are activated by a foot pedal. An additional safety feature provided by the manufacturer is the kill switch that is located on the dashboard area near the ignition. This location puts it within easy reach in the event that an emergency engine shut-off is required. Go Bowen offers this product in both black and red body colors in highly durable paints. This video of one of the product distributors shows adults hot-dogging in the go-cart. This video showcases the movement and clearance on asphalt while demonstrating how easily an over-sized rider can cause wheels to lift while turning. The Go Bowen Go Kart is designed to provide older children with an entertaining and safe motorized drive with limited speeds. If you have experience with this product, we’d love to hear about it. Lastly, advice or suggestions for potential customers of this go-cart is welcome, too! People really seem to like our freestyle scooter best of article, maybe you should check it out!